I love the quiet time in between seasons. It's meditational. In between winter and spring, there is a crystal feel in the air. 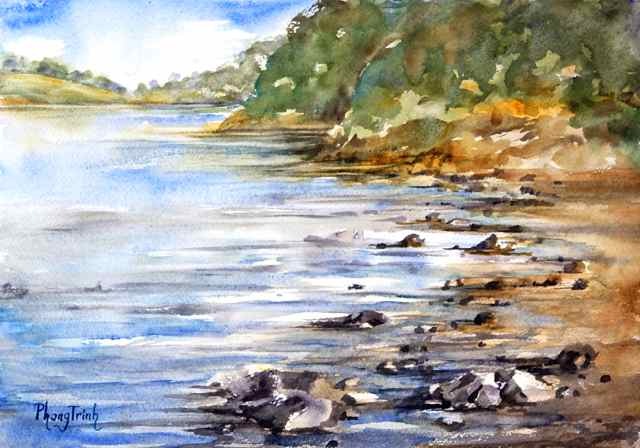 Little touch of light gave definition to gentle movement on water and rock edges. I love the rich warm texture of earth the dark of volcanic rocks and cool blues of sea and sky. Local features of these elements create contrast level one in my book. In receiving light and atmospheric of the moment, these natural elements gave contrast between their rugged nature and the delicate light and air. That's contrast level two! Understanding colours and tone (tone over colours or colours over tone! ), observation, composition and techniques and.. of course ..me, my perception! .. Sometime it pays not to analyse anything at all. Just get on with it. The scene looks simple. It is simple, the seaside and me!.. It is simply love! just love it, that's how painting becomes easy!.. else I don't think I can paint.. I don't think I can say things without words! Knowing extreme conditions of climate change, en plein air painting becomes more special to me than ever.. by sharing publicly, I hope to pass on a simple message "Enjoy earth and look after her! there is no replacement. she is home.."